Are you looking for a trustworthy & professional house removals company in London? If you are looking to move house and need an affordable removal company in London, then look no further! When it comes to removal company prices, you’ll find we offer excellent value for money on all our removal and storage services. As one of London’s longest standing domestic moving companies, you can rest assured that you’re in safe hands with us when it comes to moving. 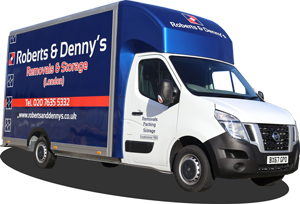 Roberts & Denny’s have earned the reputation as one of the best removal companies in London and your one-stop shop for moving house. For decades our highly skilled and experienced house movers have been helping people move home swiftly without any hiccups. We offer fully insured domestic removals services to all our customers which guarantees the safe removal and delivery of your possessions. Moving home can be a daunting prospect for some, but it doesn’t need to be a stressful experience. Here at Roberts & Denny’s we’ll take care of everything leaving you free to enjoy moving into your new home. Our expert packers and movers will take care of everything for you right down to the small details. We will even advise you on packing materials needed for certain items should it be required to guarantee a safe removal during transit. With our large fleet of modern removal vans and home moving vehicles, we have the capacity to complete moves of all sizes. From small removals to large family households, we have the service and experience needed to offer you a first class experience that you’d be happy to recommend to your friends and family. You can request a free house removal quote by using our online contact form. If you’d like to arrange a free no obligation survey or find out more information about our excellent home removal services, please contact our move team today on 020 7635 5332. 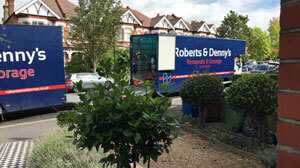 Why Choose Roberts & Denny's House Removals London?